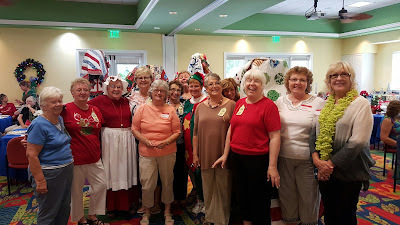 Hope has been fortunate to receive donations from the Sandoval Quilt Club, with assistance from additional members of the Cape Coral Quilters Club, for more than 12 years. 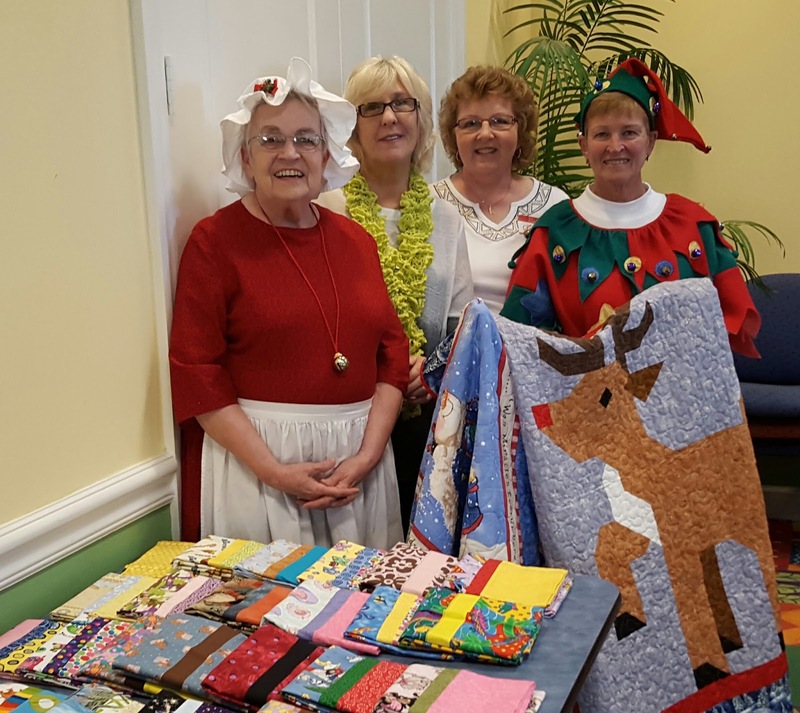 Each year in March, the Club invites Hope and at least ten other agencies to the blessing of the quilts that they have made. These beautiful donations are used for to keep our patients warm at Hospice House Cape Coral. About 4 years ago, Mary Lou O’Phelan started creating Christmas quilts for Hope. The first year she made about 10 or so by herself. Since then she has created a subcommittee within the group, to help create even more items for those in need at Hope. At the subcommittee’s recent holiday luncheon at Sandoval, Nina Tomasello picked up 100 Christmas quilts! Some of the quilts were used for children in our Hope Kids Care program - along with special Christmas pillow cases and stockings, which are new this year. The Twelve Days of Hope: Ways to Support Our Mission during the Holidays! Donate to the Tree of Lights. You’ll receive a personalized ornament with the name of your loved one. Give online, call (239) 482-4673 or visit the front desk of any Hope Hospice House for assistance. Our twinkling trees may be viewed through January 1, 2016. Make Purchases through Amazon Smile. When you shop through this portal, Amazon will donate a percentage of your purchase back to Hope Hospice. There is no cost to you to participate. Every dollar counts! Donate to our PayPal Giving Fund during December – we’ll get 101% of your donation. Your gift helps provide compassionate care for individuals with physical, emotional and practical challenges. Send a Christmas card to someone in Hope’s care. Many of these individuals live alone in facilities, and they would truly appreciate knowing that someone is thinking of them during the holidays. A simple message may bring a smile to someone in need. Please mail your cards to Smiles for Hope, 9470 HealthPark Circle, Fort Myers FL 33908 before December 21, 2015. Donate to the Hope Chest Resale Stores. Your gently used clothing, home goods, and furniture can be donated in support Hope’s mission. Proceeds from our store s are incredibly important to our financial success. You can drop off items to our North Fort Myers or Bonita Springs location. We also offer free furniture pick-up; call (239) 652-1114 to schedule. Help grieving children through our programs, including Rainbow Trails bereavement camp. Our weekend camp is provided free of charge to all in need, thanks to generous community support. Your gift will give these brave young hearts the age-appropriate counseling they need to cope with grief and loss. Provide a dedication stone, bench or tree in our Tribute Gardens. Items can be engraved with a personal message of your choice and placed at your preferred Hope Hospice House. Hope’s beautiful outdoor spaces provide a calming, quiet atmosphere of reflection for all of our visitors. All dedication items become a permanent parts of the Hope Tribute Gardens. Give the perfect present for the cook in your life. Check out our new cookbook, “Bouquet of Hope” featuring all new recipes and hundreds of pages of mouth-watering ideas. Cookbooks are available online or at the front desk of each Hospice House for $25 each. Support Hope’s VALOR program for veterans. Your gift helps the veterans in our receive the specialized care they deserve – including an Honor Guard recognition ceremony, customized certificate of appreciation, lapel pin and patriotic quilt. Every dollar is invaluable to our mission and honors our nation's heroes. Give your time – become a Hope volunteer. Volunteers may choose to help with making phone calls, baking cookies, visiting patients, creating scrapbooks, sewing quilts, running errands, filing paperwork and hundreds of other tasks. All volunteers complete an orientation class and receive ongoing support from our volunteer department. Sponsor a Special Event. Your business or organization can benefit from these exceptional marketing opportunities. We’ll promote your brand in invitations, event programs and e-blasts. A portion of your sponsorship will be tax-deductible, and your donation will benefit your friends and neighbors here in southwest Florida. Call (239) 489-9164 for available sponsorship options. Let someone know about the Hope Parkinson Program. Do you have a friend, neighbor, coworker or loved one who is facing the challenge of Parkinson's disease? Have them join our free program for exercise classes, support groups, educational opportunities and socialization.